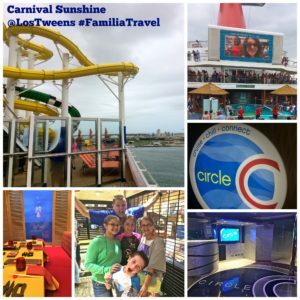 Los Tweens & Teens Publishing team was invited to experience the relaunched Carnival Sunshine on its two-day welcoming cruise to Post Canaveral. As always, all opinions are our own. Thinking of heading to Florida this year for some summer fun? Of course, Orlando has a world of options and something I had never ventured to… Port Canaveral, less than an hour away from central Orlando. Our publishing team had the opportunity to experience the fully refurbished Carnival Sunshine following its major interior redesign and repositioning to Port Canaveral for year-round cruising. During the two-day experience, Carnival unveiled plans for its new Club Ocean program that is created for families with tweens and younger siblings ages 2 – 11. These programs at sea allow for families to have the opportunity for unique experiences with kids on their own or stay together the entire time. It’s nice to have options! Probably our favorite experience was (drumroll…) the nighttime outdoor movies on the Lido deck. The deck becomes a virtual movie theatre but you enjoy the cool ocean breeze- many were even watching while in the pools! There were movie options for the younger kids but the older tweens were thrilled to see the ‘Hunger Games’ on the big screen. As far as the food, we enjoyed the onboard ‘Guys Burger Joint’ and the variety of smaller restaurants onboard instead of the major buffets. But that’s an individual preference as I simply like smaller venues. What type of vacation do you need? Is it bonding time for everyone together or due to the various age levels in your family you need to explore various options? Where would you like to go? Perhaps experience new Caribbean islands and beaches or is it time for Europe and more far-off locations? Do you want to combine a shorter cruise with a nearby destination stay? That’s is what our team actually did – we ventured to the Disney Parks following the cruise. 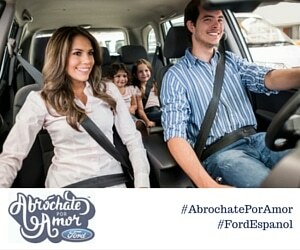 Are you traveling with extended family and friends like Abuelos or primos (grandparents or cousins)? This is an important consideration. You’ll have to plan for their stay and entertainment as well. Do you and your children have their immunizations current? Before ANY travel you should check with your pediatrician to review your individual needs. Do pack less than you think you’ll need- spaces on cruise ships simply are smaller and you should plan for less. We’d love to hear about your summer vacation planning! Share your plans below in the comments area as we will be producing travel content all summer long and would love to potentially feature your photos or videos. As always you can reach us via: team@LosTweens.com. 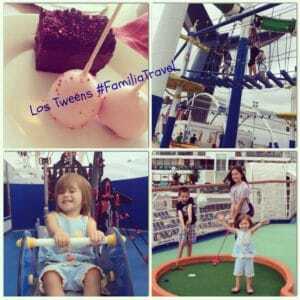 This entry was posted in Travel and tagged cruise, cruising, Familia Travel, summer travel. Bookmark the permalink.